LATEXO – The Grapeland Sandiettes hit the road on Tuesday afternoon, April 9, for a game against the Latexo Lady Tigers. Grapeland knew that to have any hopes of repeating as district champs, they would have to take care of business against Latexo. 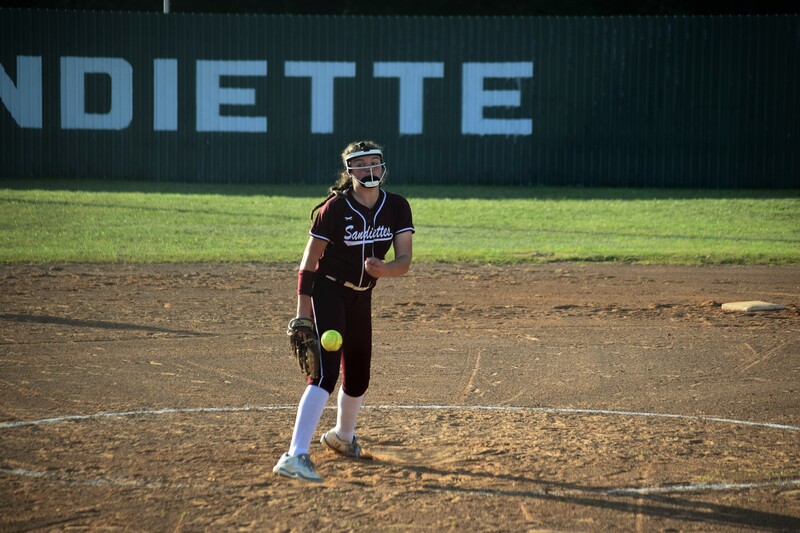 The Sandiettes did just that as they hammered out 11 hits which led to 18 runs while the Sandiettes’ All-State pitcher – Cadie Belle Currie – held the Lady Tigers to only one hit as Grapeland coasted to an 18-0 win. The fireworks at the plate started in the first inning as the Sandiettes crossed the dish four times to take and early 4-0 lead. Kiera DeCluette led off the game with a single to right and advanced to second on an error. Diamond Dunn was up next and laid down a bunt which allowed DeCluette to round the bases and score the first run of the game. Dunn was safe at first and when Cierra Simon doubled into left, Dunn was able to motor around the base paths to make the score 2-0. Simon stole third and after watching a strike go by, Latexo’s Bailey Ingle walked Currie on four straight pitches. Hailee Gochnour came in as a courtesy runner for Currie and when Ingle threw a wild pitch, Simon scampered home and Gochnour moved to second. Cheney Boyd was up next and hit into a fielder’s choice which erased Gochnour from the bases. Boyd was safe at first and when Jaycee Graham slapped a single into left, Boyd managed to work her way to the plate to make the score 4-0. After Jessi Cunningham drew a walk, Graham was gunned down at third, trying to steal. Madi McCombs ripped a single past third to advance Cunningham and then KeKe Harris walked to load the bases. She was picked off at first, however, and Ingle escaped without any further damage. Currie was in the pitcher’s circle for the Sandiettes and she was on top of her game. Diana Maza led off for Latexo and roped a single to center. She stole second but that was as far as she got. Currie struck out Ingle, forced Madi Catoe to hit into a 6-3 force and then coaxed a pop-up to third to end the inning. DeCluette led off the second and reached on a four pitch walk. She was picked off, however, for the first out. Dunn followed with a bunt single and just like in the first inning, she came around to score when Simon doubled. Currie was up next and popped up in foul territory for the second out. It looked like Ingle might get out of the inning relatively unscathed, but then the bottom fell out. Boyd and Graham both walked to load the bases. Cunningham was up next and picked up a RBI when she drew a walk. McCombs followed with a single to drive-in Boyd and Graham while Cunningham moved to third. A wild pitch allowed Cunningham to cross the plate and when Harris doubled into right, McCombs trotted home to make the score 10-0. DeCluette came to bat again in the top of the second and reached on an error which moved Harris to third. She stole second and moved into third on a wild pitch that scored Harris. Dunn drew a walk and stole second while a passed ball allowed DeCluette to score and moved Dunn to third. Dunn crossed the plate on another wild pitch and Simon drew a walk but was picked off at first to end the inning with Grapeland ahead 13-0. When the Lady Tigers came to bat in the bottom of the second, Currie slammed the door on any comeback hopes they might have had. She caught Harli Brent looking at strike three and then got both Taryn Curless, along with Lanie Davis to ground back to the circle to retire the side in order. In the third inning, the Sandiettes tacked on five runs to make the score 18-0 and when Currie struck out the Lady Tigers’ side in the bottom half of the inning, the game was called due to the 15-run mercy rule.